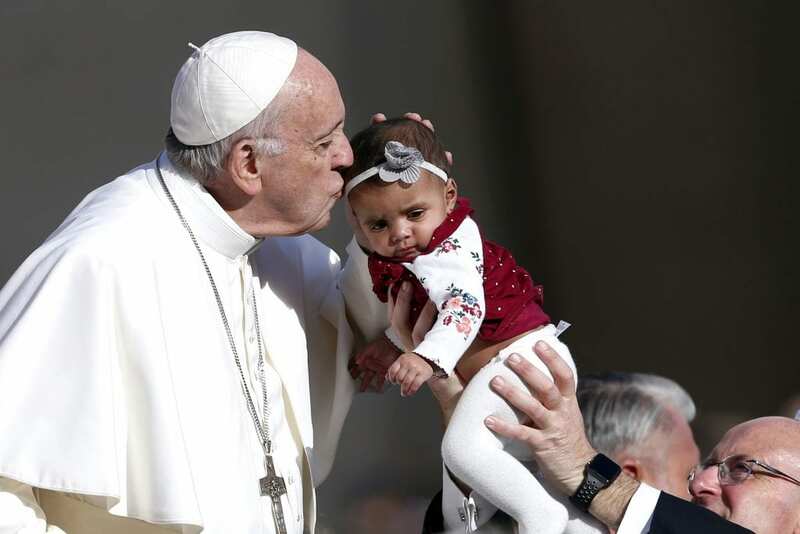 Pope Francis kisses a baby during his general audience in St Peter’s Square at the Vatican on 7 November. Photo: Paul Haring/CNS. Life is for loving, not amassing possessions, Pope Francis said on 7 November during his weekly general audience. In fact, the true meaning and purpose of wealth is to use it to lovingly serve others and promote human dignity, the Holy Father explained. The world is rich enough in resources to provide for the basic needs of everybody, he told those gathered in St Peter’s Square. “And yet, many people live in scandalous poverty and resources – used without discernment — keep deteriorating. But there is just one world. There is one humanity,” Pope Francis added. The Holy Father continued his series of talks on the Ten Commandments, focusing on the command: “You shall not steal”, which reflects respect for other people’s property. However, he said, Christians should also read the commandment in the light of faith and the Church’s social doctrine, which emphasises the understanding that the goods of creation are destined for the whole human race. The Catechism of the Catholic Church teaches that the “primordial” universal destination of goods does not detract from people’s right to private property, he said. However, the need to promote the common good also requires understanding and properly using private property. “No one is the absolute master over resources,” he said, which reflects the “positive and wider meaning of the commandment, ‘Do not steal'”. Pope Francis meets Merina from the Macuxi tribe in Brazil during his general audience in St Peter’s Square at the Vatican on 7 November. Photo: Paul Haring/CNS. Being in possession of material goods brings with it much responsibility, Pope Francis said. If hunger exists in the world, he added, it is because the needs of the economic market come first, for instance, when keeping prices up means demanding that food be destroyed or thrown away. What is lacking is “a free and farsighted business sense that assures adequate production and fair planning, which ensures fair distribution”. Pope Francis underlined the importance of viewing possessions and wealth from the Christian perspective of gift and generosity, saying “what I truly possess is what I know how to give”. “If I know how to give, I am open, I am rich,” not only in possessions but in generosity, knowing it is a duty to give so everyone can have a share, he said. The devil always enters people’s lives “through the pockets” with money, the Pope added. Instead, ownership must be an opportunity to multiply those goods “with creativity and use them with generosity and that way grow in charity and freedom,” Pope Francis stated. While the world breathlessly seeks to have more and more, God – rich in mercy – redeemed the world by making himself poor, paying a priceless ransom on the cross, he said. For Christians, the full sense of “Do not steal” means loving with what one owns, taking advantage of one’s means as a way to love others as best one can, Pope Francis said.